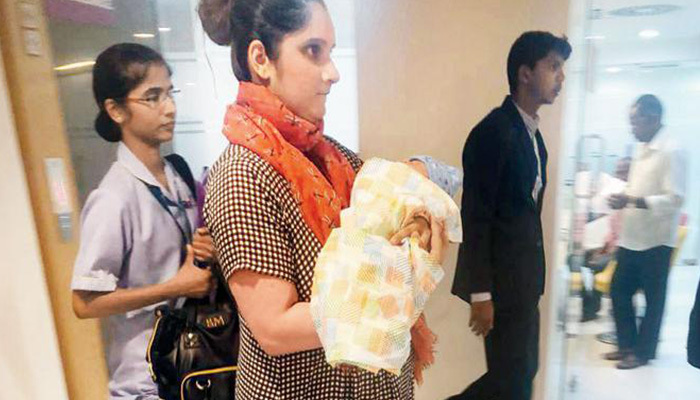 Indian Tennis ace Sania Mirza and hubby Shoaib Malik welcomed parenthood on October 30th, 2018 after being blessed with a baby boy. The celebrity couple went on to name the new member of the family as ‘Izhaan Mirza Malik’, which translates to ‘God’s Gift’ in Arabic. While the world has been dying to see a glimpse of Izhaan, Sania was spotted leaving the Rainbow Children’s Hospital with her son earlier today. Wrapped in a printed towel and a cap on his head, you can bet the baby looked way too adorable in his mother’s arms. However, what’s even more beautiful is mommy Sania Mirza’s post on Instagram, appreciating the arrival of the child. Posting a photo of the baby boy, the three-time Grand Slam winner termed the joy of being a mother as the greatest tournament she has ever won. Highlighting the funny side of it, she mentioned that she along with Izhaan has also spent some time watching Shoaib play cricket. Last but not least, she thanked each and everyone for their wishes and love on behalf of the whole family. So it’s been 5 days since we came into this world .. Me as a mother and my little Izhaan as my son ❤️ we’ve even watched Baba play some cricket together since we’ve arrived 😀 it truly is the biggest match ,tournament achievement I’ve ever won or had and there is no feeling or blessing that can be greater than this.. I finally have gotten sometime after this overwhelming feeling to get online and check the msgs and love we have received. Shoaib and I feel truly blessed and humbled with the wishes and love that us as parents and Izhaan have received ❤️ Thank you to each and every one of you ..we love you right back!